Viking Books for Young Readers, 9780670016525, 48pp. In the early 1900s, Robert Miller, a.k.a. “Count Victor Lustig,” moved to Paris hoping to be an artist. A con artist, that is. He used his ingenious scams on unsuspecting marks all over the world, from the Czech Republic, to Atlantic ocean liners, and across America. 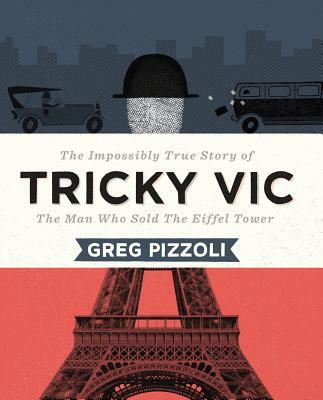 Tricky Vic pulled off his most daring con in 1925, when he managed to "sell" the Eiffel Tower to one of the city’s most successful scrap metal dealers! Six weeks later, he tried to sell the Eiffel Tower all over again. Vic was never caught. For that particular scam, anyway. . . . Kids will love to read about Vic's thrilling life, and teachers will love the informational sidebars and back matter. Award-winner Greg Pizzoli’s humorous and vibrant graphic style of illustration mark a bold approach to picture book biography. Greg Pizzoli is an author, illustrator and screen printer from Philadelphia. His first picture book, The Watermelon Seed, was published by Disney*Hyperion Books and was the 2014 recipient of the Theodor Seuss Geisel Award. Greg's work has been featured in The New York Times, Communication Arts, 3x3 Magazine and he's won two Portfolio Honor Awards from the Society of Children's Book Writers and Illustrators. After college, Greg spent two years as a full-time volunteer in AmeriCORPS from 2005-2006. In 2009, he received his MFA from the University of the Arts in Philadelphia, where he now teaches. Greg lives in Philadelphia with his wife and two unruly cats.